Looking for ready-made Excel macros that will streamline your workflow? Look no further! 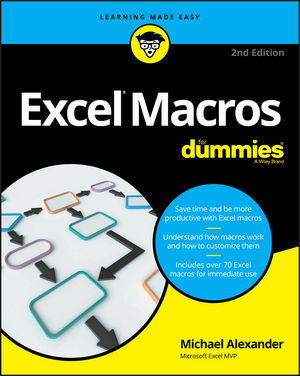 Excel Macros For Dummies, 2nd Edition helps you save time, automate, and be more productive–even with no programming experience at all. Each chapter offers macros you can implement right away, with practical exercises that extend your knowledge and help you understand the mechanics at work. You'll find over 70 of the most effective Excel macros for solving common problems and explanations of why and where to use each one–plus invaluable guidance and step-by-step instruction for applying them effectively. Microsoft Excel is the world's leading spreadsheet application, and it supports VBA macros that allow you to customize the program and automate many common tasks. In no time, you'll learn how to customize your applications to look and work exactly the way you want them to, with simple, friendly walk-throughs that directly apply to real-world tasks. Follow it through from start to finish, or quickly look up problems as they occur. It's the perfect desk reference for all of your Microsoft Excel macros needs! If you have an Excel problem, there's a macro to solve it–and now, you don't need to be a programmer to customize it for your own use!. Michael Alexander is a Microsoft Certified Application Developer (MCAD) who has been named a Microsoft MVP for his ongoing contributions to the Excel community. He has more than 15 years of experience in consulting and developing Office solutions, and shares basic Access and Excel tips on his free tutorial site, www.datapigtechnologies.com.